Christ's Team is about Christianity, science and teamwork in the pursuit of better lives for all people. Teamwork is a word that is being used by many organizations in many different ways. What one group defines as "teamwork" does not mean the same for another group. So, what exactly does the word "teamwork" mean? To help you understand and have a basic working knowledge of "teamwork" here are the Ten Commandments for healthy team development. 1. Everyone on the team is equal. No one is superior to another on the team. 2. Each person on the team is called upon to use his or her unique skills. Individual team member skills are essential for a strong team to develop. 3. Real communication on a team cannot be dominated by one or two individuals if the team is to be successful. 4. Organization of teamwork is not a "top-down" organization. There is not a "president", "boss", "chairman", etc. However, every team does need a coach. 5. Opinions are unique; therefore if a team is to be successful each person must share their unique opinions. 6. Each person of a team must be willing to develop their unique skills. Teamwork training is necessary for the success of any team. 7. Teamwork calls upon the individual to merge their concepts and ideas with others. This intensifies the overall talent of the team. A willingness to share is absolutely needed. 8. True teamwork can never be accomplished by one individual telling others what to do. Everyone's voice must be heard and appreciated. 9. Teamwork can get a task done quicker when many people are involved. Rule number nine is to be sure everyone is involved, always! 10. There may be times when a task may take more time due to the diversity of opinions, however, when the team makes a decision the results will be powerful! Teamwork is a concerted effort of many diverse talents and skills to accomplish a task that cannot be accomplished alone. Teamwork has been understood as far back as ancient times. The ability to accomplish a teamwork task calls for the individual to be dedicated to the unified effort. Greater things can be accomplished when the many become one. That is the simple explanation of teamwork. Click on the product number. 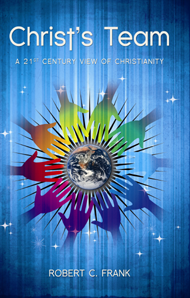 Excerpt from the book, p. 8 "Christian tradition emphasizes the role of Jesus Christ as redeemer, but human history has verified that he also came to teach humans how to work together and care for each other. Under the guidance of the Holy Spirit, his followers have become a Team dedicated to carrying on creation, improving human life, and managing our planet." The first slide presentation just below is a quick summary of how God is creating an improving civilization on earth. The second describes how science aided the spread of the gospel. To view either one FULL SCREEN click on the arrows in the bottom right corner. The right-left keys on your computer can be used to advance the slides. Press the ESC key to return to this view. A beautifully written and thoughtful view of the history of the universe. Copyright 2015 Christs Team . Picture Window theme. Powered by Blogger.